War is coming to Ruthnia. As ancient, inhuman powers move against one another, Rel Kressind finds himself in the company of the fabled modalmen - giants who regard themselves as the true keepers of humanity's legacy. Far out in the blasted, magical wastelands of the Black Sands where no man of the Hundred has ever set foot before, Rel comes face to face with the modalman's deity, the Brass God. 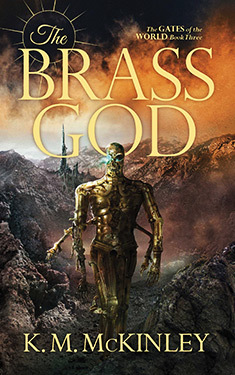 What Rel learns in the Brass God's broken halls will shake his understanding of reality forever. Magic and technology combine in an epic fantasy like no other, where lost science, giant tides and jealous gods shape the fate of two worlds, and the actions of six siblings may save a universe, or damn it.